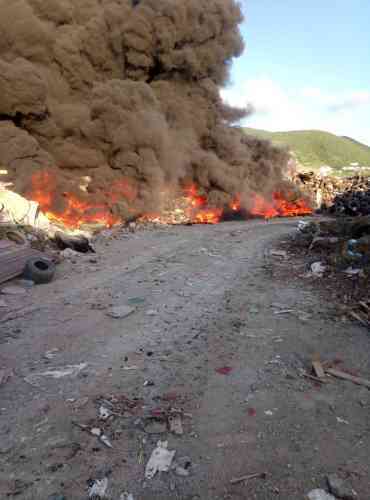 POND ISLAND–Yet another angry orange blaze on the country’s problematic dump Saturday night into Sunday caused the temporary closure of the site to garbage haulers and forced residents to shut their doors and windows against the blanketing smoke. The Ministry of Environment and Infrastructure VROMI issued the temporary closure notice early Sunday. That notice was followed by the reopening of the site later in the day to haulers of household garbage. Access was given via the main entry gate where drivers were given instructions by on-site personnel about the designated area for off-loading. The fire started before midnight Saturday. The Fire Department, contacted by the police, reacted to the fire alarm. Fire personnel and those of VROMI put in many hours of work to contain the fire.